For the September monthly challenge on Somewhat Simple, the forth project was to make an appliqued tee-shirt for my son. Here are the shirts that Tanya made: So CUTE!! I was a little nervous about using the Wonderunder and sewing on the appliques but it was not that hard and once I started I could not stop! Tanya has a great tutorial and she even tells you how to buy the Wonderunder! 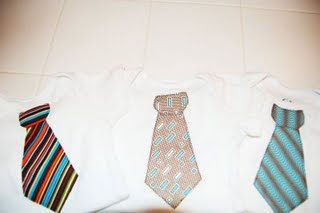 I made a tie shirt for my son. I also came up with the truck pattern for a second shirt. I also made a few onesies for some showers I have coming up! A tie-onesie for a baby boy and a flower-onesie for a baby girl. Very cute. I really like your truck pattern. SO DANG CUTE! I haven't ever tried wonder under either, so it should be interesting. Thats what I am working on today! Wonder Under is my best friend. It's so stinkin' easy! Yours turned out great. Thay are all so cute!